Evander Holyfield compared gays to the handicapped and believes they can be cured of what he calls their lifestyle choice. 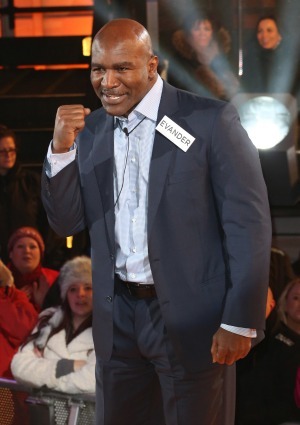 Evander Holyfield is in hot water for some homophobic comments he made in the Big Brother house — but while singer Boy George is slamming him, the boxer’s son is defending him. The boxer’s son tried to defend his dad today, but may have only succeeded in digging a bigger hole for him. “My dad is the most loving and caring person you will ever meet. He treats everyone like a human being, even if they are homosexual,” Ewin Holyfield told TMZ. But not everyone was so forgiving. Culture Club lead singer and out gay man Boy George ripped Holyfield apart on Twitter, hinting he shouldn’t even be allowed in Great Britain to film the reality show.